Intergenerational activity that is respectful and purposeful defeats isolation and loneliness, Canada’s leading health concern in both young and older persons. What Are Possible Goals of Intergenerational Learning? Each intergenerational (IG) project will vary in its scope of time spent, and degree of involvement of participants. Although initially only one goal may be set, our findings over the past eight years have shown that by connecting older adults, children, and youth, in meaningful social exchange, there are many hidden benefits. Baby steps brings generations purposefully together perhaps once or twice a year. Mama steps brings generations purposefully together on a regular basis, weekly, or monthly. Giant steps brings generations purposefully together in a full IG immersion scenario. What is the difference between intergenerational immersion and full intergenerational immersion? Intergenerational immersion is defined for our purposes, as any situation whereby different generations interface purposefully within each others’ living/working space. For example, if a youth group enters a care home to participate with older adults in some planned manner, this is our definition of intergenerational immersion. If older adults visit a school to participate in an event, this is intergenerational immersion. In each case, connecting of the participant groups is intentional, with specific intergenerational goals in mind, and takes place within one or the others’ living space. The resulting connections, developing in this real life context, allow opportunities for growth in understanding and empathy, and build hope for relationships in future communities. Meadows School ProjectTM is an unique example of FULL intergenerational immersion. In this project model, the class moves right into the care facility and not only continues their dedicated work, but interfaces directly and meaningfully with interested older residents. 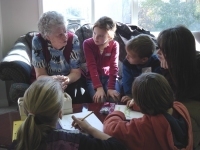 Several pre-school intergenerational projects across Canada have their facilities embedded in that of the older adults’. The Meadows School ProjectTM model focusses on students in the elementary to middle school age group.